During my visit to Dresden for the #youngDresden project, I decided to let random locals in the street guide me. Welcome to directed by Dresden, and see where I ended up! I was first directed to Dresden by Kurt Vonnegut’s book Slaughterhouse-Five. The author was present during the Dresden’s bombing, one of the darkest chapters of WW2. 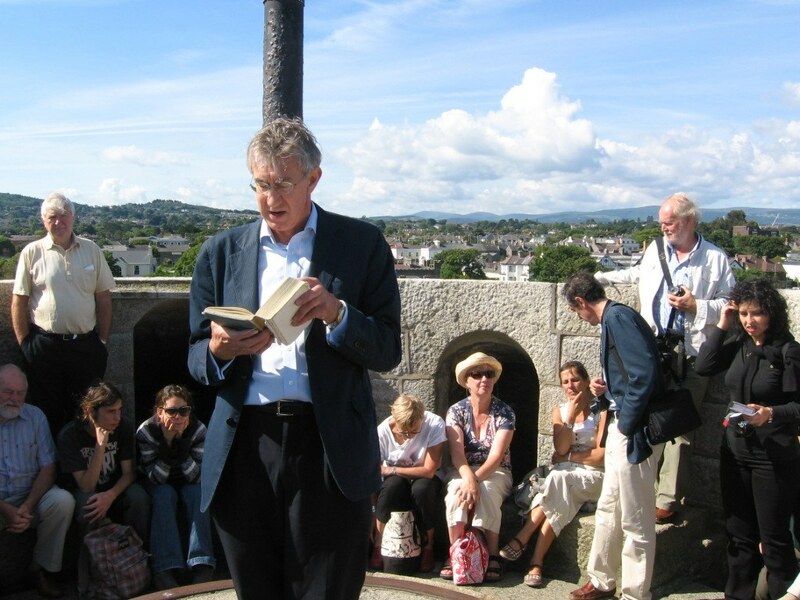 He was a prisoner of war, housed in a compound termed Slaughterhouse-Five. This is how he describes his arrival in the city, one month before it was bombed. Between 13 and 15th February, 1945, ninety per cent of the city was destroyed. Gone. Gone were the ‘merry amoretti and garlands above windows’, gone was the skyline across the river Elbe, gone were the Zwinger and the Semperoper. The once-majestic Baroque town had been reduced to rubble. 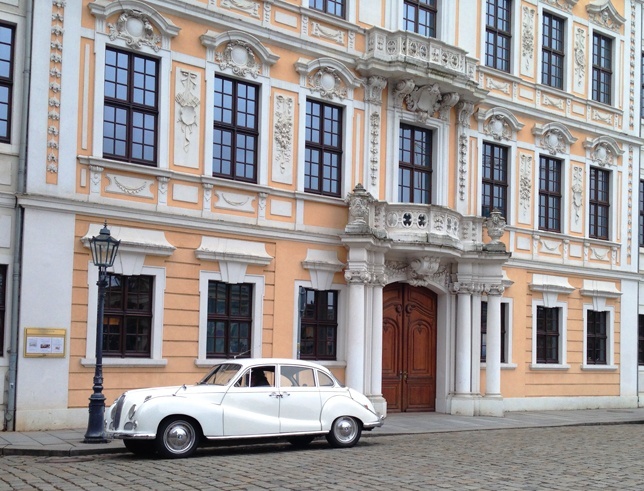 Exactly seventy years later, I travelled to Dresden. 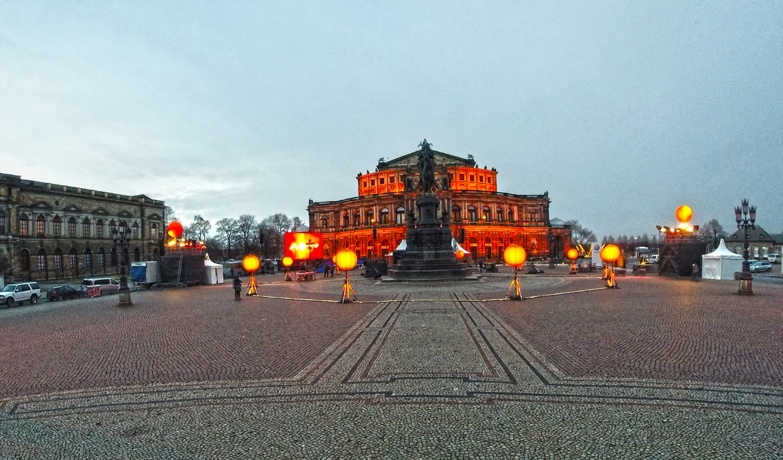 The town had been rebuilt – the Altstadt in all its Baroque splendour reflected onto the Elbe once again, the Zwinger and the Semperoper had risen from the ashes. It was indeed magnificent. But, somehow, it all felt fake, like an open-air museum. East German bricks and mortar were able to rebuild the city as it once was, but its soul was erased by the bombs, on those fateful nights in 1945. So, I had an idea. If I couldn’t find the soul of the city in its streets and buildings, I would ask locals to help me. I decided to discover the city through the eyes of locals, following their advice. I would ask a random person to tell me where to go – it could be a tourist sight, a shop, a bar, a restaurant, whatever. Then, I would find another person, and get them to direct me. And again. I ended up spending a whole day being directed by Dresden. Karl was the first person to direct me somewhere. He chose Grosser Garden, ‘far enough from the centre of town to feel like you’re in the country, yet close enough to get to by tram’. Grosser Garden is a Baroque-style garden, a city park since 1814, first established two centuries earlier as a hunting ground. Early on a midweek morning, the place was deserted. 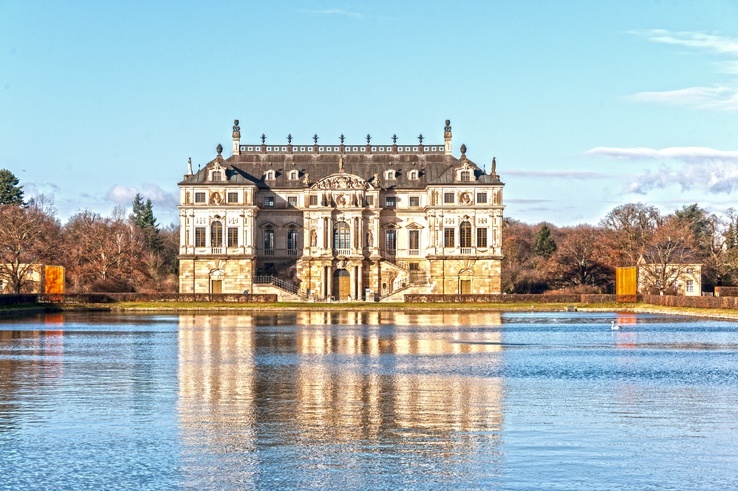 Not a soul around – no one strolling, no one walking their dog or taking in the beautiful view of the Sommerpalais reflecting in the pond. The original Sommerpalais was another casualty of the firebombing. The one I saw was the post-war reconstructed version; the exterior was rebuilt in the Fifties, the interior is not yet completed. I spent some time wandering around the quiet lanes of Grosser Garden, and indeed it did feel like being in the countryside. But after a while, it got a little TOO lonely. So, as soon as I spotted two humans in the distance, I ran straight towards them, to get my second direction. Lisa and Tim were the young couple I spotted in Großer Garden. He was on a skateboard, she was on a bicycle. Lisa recommended I visited Kathrinstrasse, because she ‘likes the architecture’. I headed out of the garden and caught the tram towards Neustadt. Stangely enough, the Dresden Neustadt (new city) is actually older then the Altstadt (old city), as most of it was spared by the bombs. 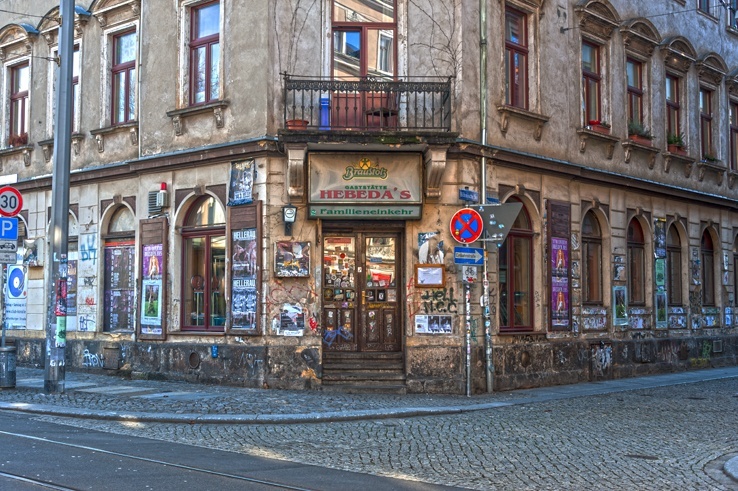 Nowadays, Neustadt is the centre of Dresden’s nightlife and alternative culture. Walking around Kathrinstrasse, I understoon what Lisa meant. The area felt vibrant, real, alive. It wasn’t just the architecture. It was the feeling that memories weren’t lost. 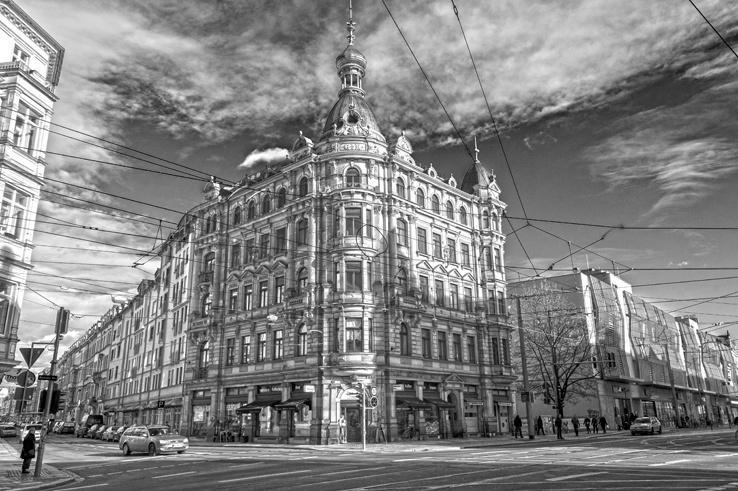 The old and new coexisted, side by side – a grandiose past and an alternative present. 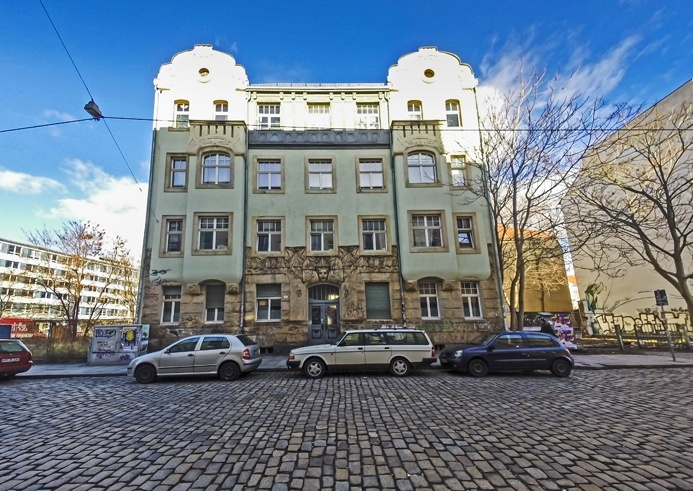 I walked past a bar that during the war used to supply local families and refugees with hot water every Sunday, past a bicycle-repair shop with bicycle-themed street art outside and a beautiful Art Nouveau mansion. I walked up and down Kathrinstrasse for a while, taking in the wonderful street art, and looking for an English-speaking local to direct me to the next stop. After a bit of looking around I met Andrea, a friendly middle-aged woman who sent me to Alaun Park, a couple of streets away. She said it’s a ‘little oasis of peace’ in the heart of the city. I found it odd that two out of three directions thus far had been to parks. I thought Dresdeners must love their parks! If it were summer, I might have understood. But it was a chilly winter day, not really a park kind of day. And to be honest, Alaun Park was just a park – nothing to write home about. 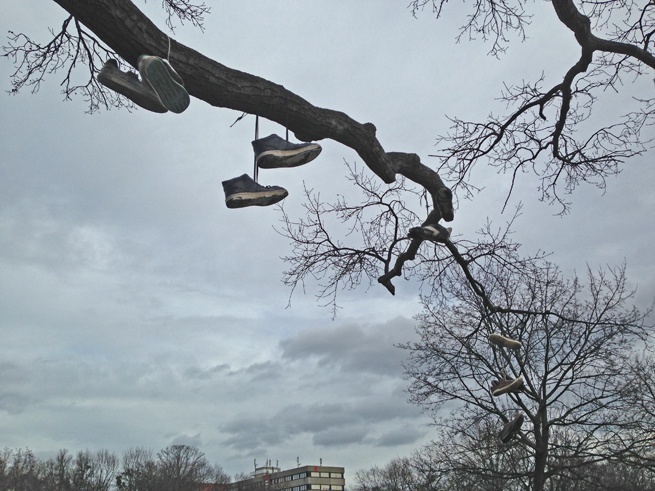 I walked around a couple of times, trying to find something worth noticing… and I did. 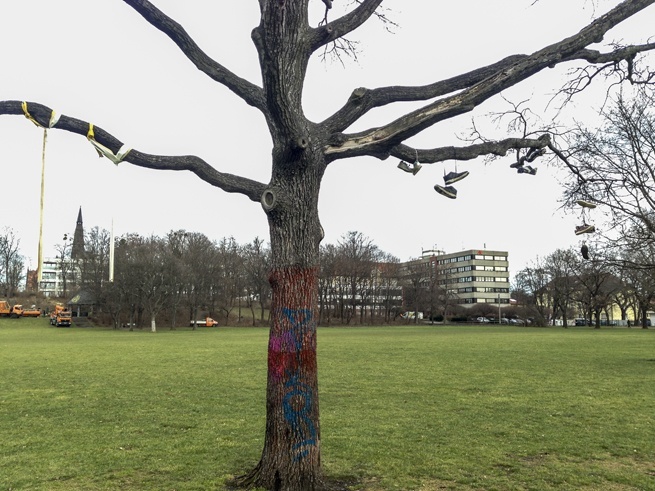 Right in the middle of the park was a large tree, with a painted trunk and shoes dangling from its branches. I thought it was cool, another example of alternative Dresden – a spirit that was becoming more and more evident as I walked around the city. Robot the pug dog was walking around the funky graffiti tree, sniffing at the ground. 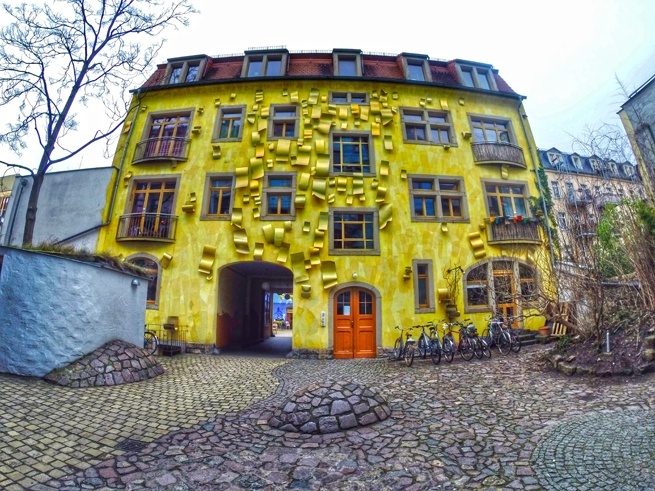 I spent some time with him and his human Susanne, talking about alternative Dresden, and she said that if I was interested in alternative sights, I HAD to see Kunsthofpassage. 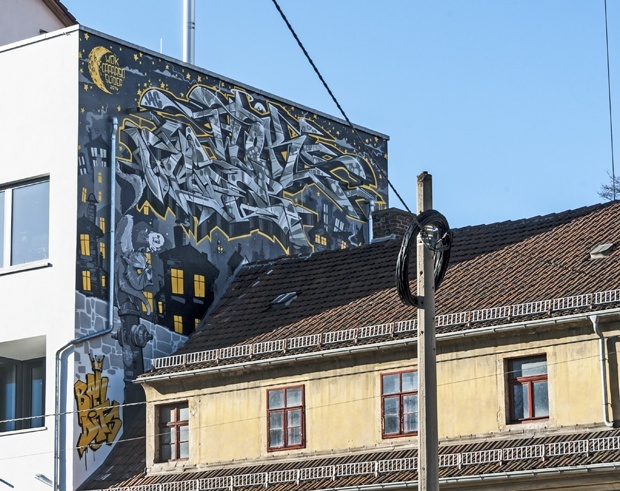 Once upon a time, this was nothing more than a maze of Neustadt backstreets, until a bunch of street artists got together and used the streets, squares and façades as their canvas. 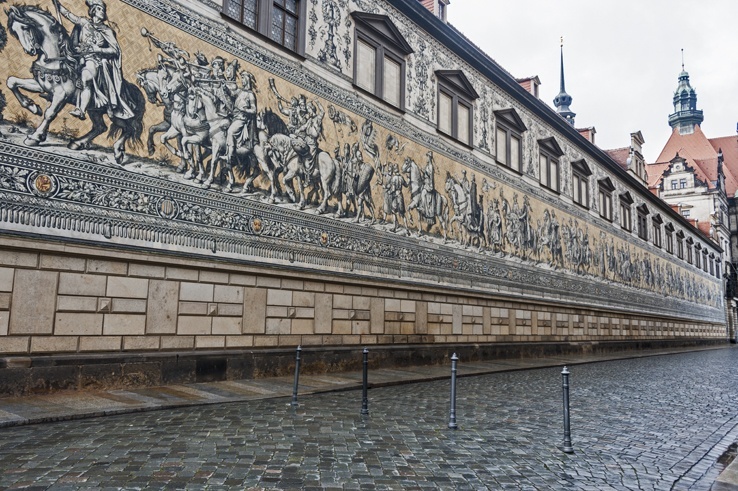 The Court of Elements nowadays is one of Dresden’s symbols, as iconic as the skyline on the Elbe. On a sky-blue house, the rain sings a melody running down a series of interlinked pipes. 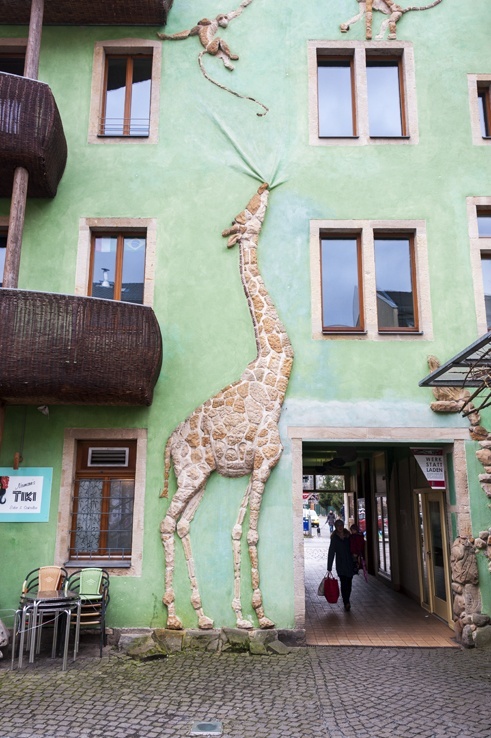 In the Court of Animals, monkeys leap over a giant giraffe that looks like it’s eating the building. The artist wanted to set up a laser trigger in the entrance of the courtyard that made one of the monkeys ‘piss’ over whoever walked through – but alas, Dresdener authorities said nein. 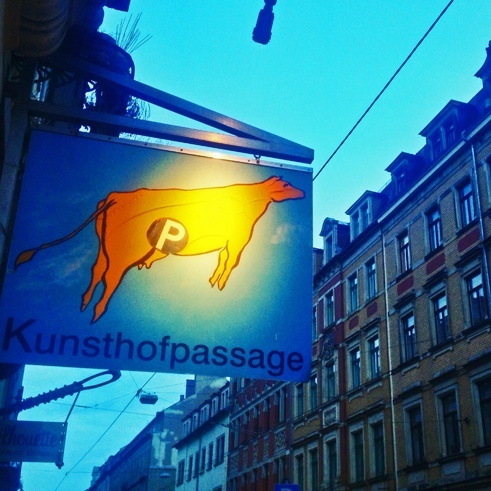 I met Mark, a twenty-something student of mechanical engineering, in the Court of Metamorphosis of Kunsthofpassage. By then it was lunchtime, so after having learnt that I was Australian, Mark suggested I go to Ayers Rock Restaurant for lunch. 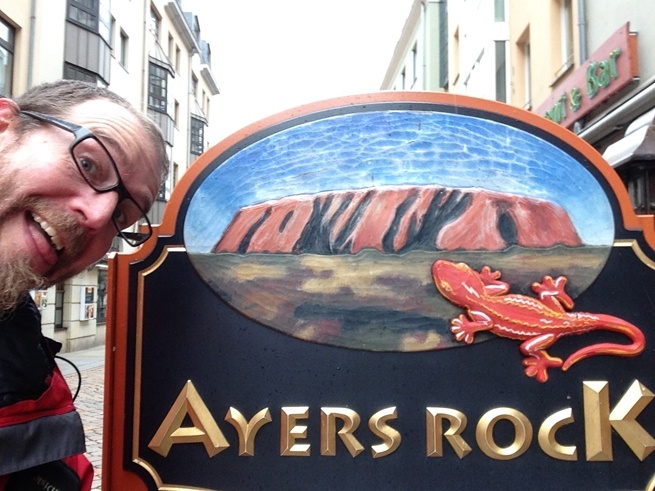 Ayers Rock was in the Altstadt, so I crossed the Elbe into the fancy faux-Baroque district. The feeling was that of walking from a friendly, welcoming community into a collection of stately, show-off administrative buildings. It felt cold and artificial – a place to look at and say ‘wow’, but that’s it. I mean, don’t get me wrong here. 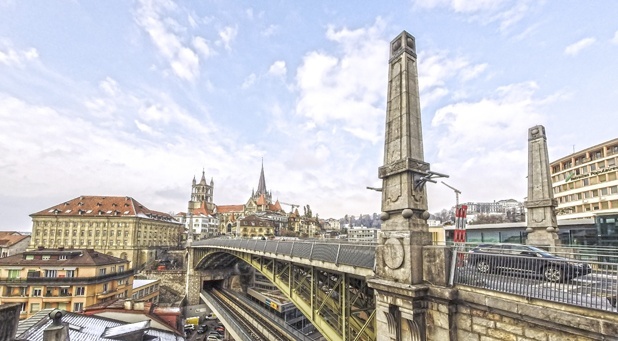 It’s amazing what Dresdeners did – literally picking up the rubble and restoring the city to its old splendour. But the feeling was that of a museum, a ‘don’t touch’ kind of feel. On the other hand, Neustadt looked real. Perhaps not so pretty, but real. Or maybe just pretty in a different way. When I found Ayers Rock, it was closed. So I went to a place two doors down and asked Jenny, the waitress, for my next direction. I was amazed I only got directed there after 5 other recommendations. 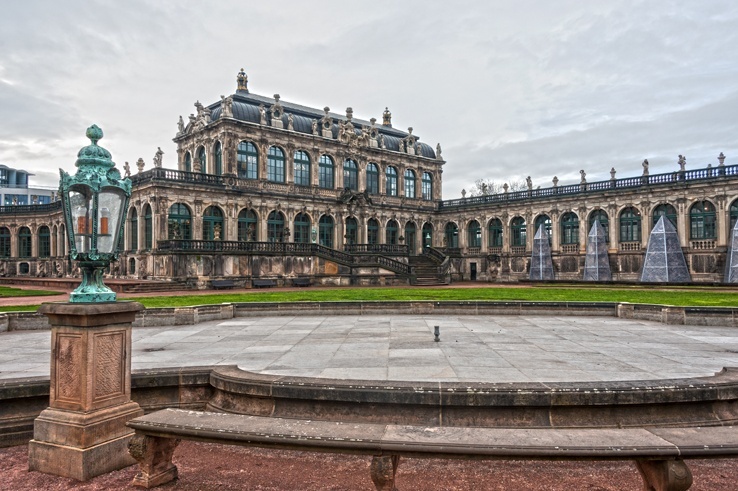 The Zwinger is a rococo palace, faithfully rebuilt after being destroyed in the 1945 bombing. 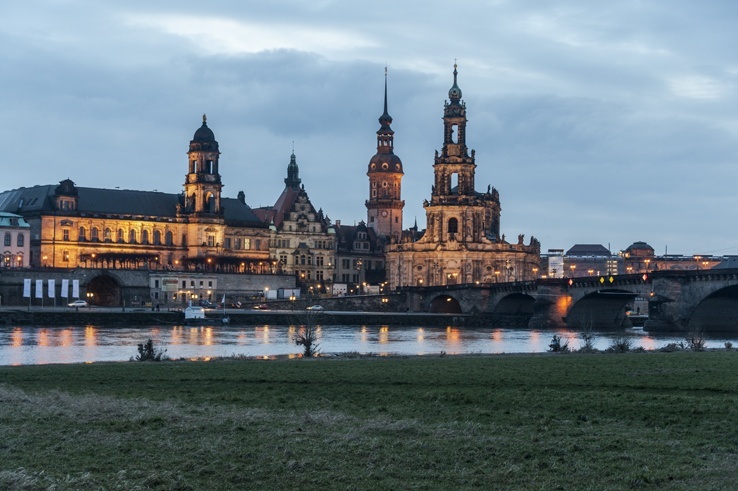 It was once Dresden’t prime sight, a wonder of stone and landscaped gardens that amazed poets and travellers from all over the globe. And now? It houses an art gallery and a porcelain museum – not exactly my cup of tea. So I wandered around its courtyards for an hour or so, until dusk fell, and I took the river back across the Elbe. That’s where another wonder happened. A wonder that Kurt Vonnegut hadn’t seen, but imagined. I was there. And it was beautiful. ‘Billy didn’t get to see Dresden do one of the most cheerful things a city is capable of doing when the sun goes down, which is to wink its light on one by one. There was a broad river to reflect those lights, which would have made their nighttime winkings very pretty indeed. It was the Elbe’. I love Dresden! I was amazed how the rebuilt it so well. When visiting the Zwinger I couldn’t tell what was old and what was new. I visited over 10yrs ago so I didn’t get to see the Frauenkirche complete! The unexpected discovery though, was VW Glaeserne Manufaktur…I got to drive the Phaethon in an almost virtual reality environment (now my fellow passenger wasn’t thrilled though)! Hey Anna! 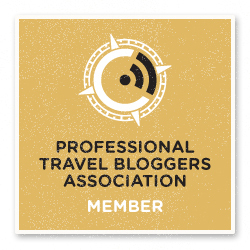 I didn’t actually get to visit Dresden, my husband Nick was there and wrote the post, but now I really want to go too! And the VW factory looks amazing! Thanks for your comment! I LOVE this idea of having locals direct you where to go! I’ll have to try this out too! You should Ellen, it’s so much fun! Thanks for your comment! Thank you! You should visit Dresden if you get the chance 🙂 It’s amazing! The ideas of locals direct appeals to me very much. Great photos. Thanks! It’s a great way to travel, you should try it too! Love being directed by random people. It is a great idea and made me think what I would direct people to in my own city. It’s always a great idea to get recommendations from local. My husband and I always do, especially for places to eat. 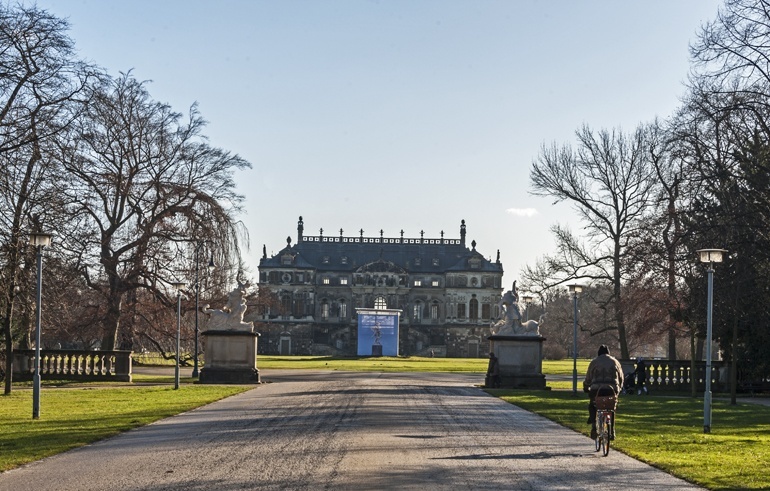 In case of Dresden, it was a good idea to find its soul through the eyes of the locals. Hopefully the city will become more soulful as time goes by. Beautiful photos, I especially adore the colorful water and fire buildings. What a cool way to figure out what to see in a city. It looks like the locals let you to some real gems. My favorite are the water house, fire house, and the one with the monkey and giraffe. I’d love to see those in person some day. I know that the loss of human life is the greatest tragedy of war, but the loss of historical buildings is sad, too. So true Michele. 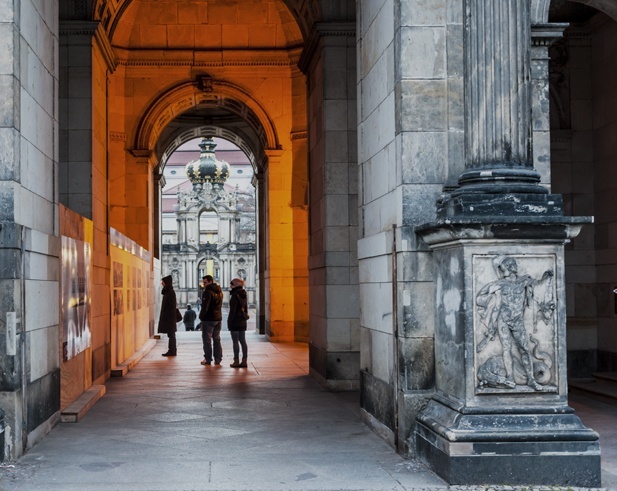 It’s amazing what folks did in Dresden – picking up the rubble to rebuild their once-grand city. 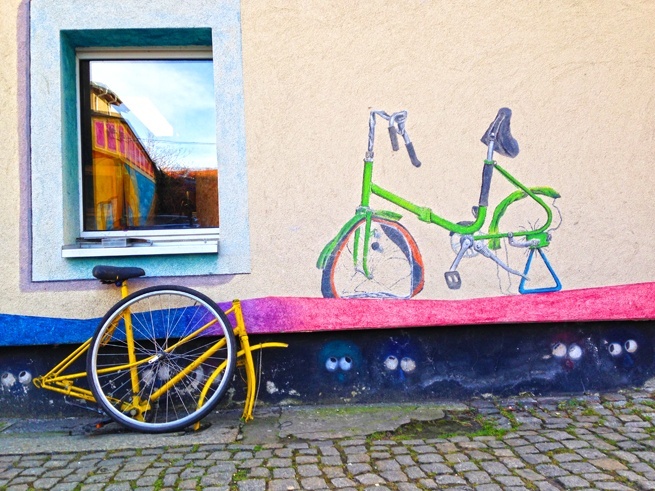 And Neustadt is great, with its quirky feel and street art! What a beautiful collection of photos! 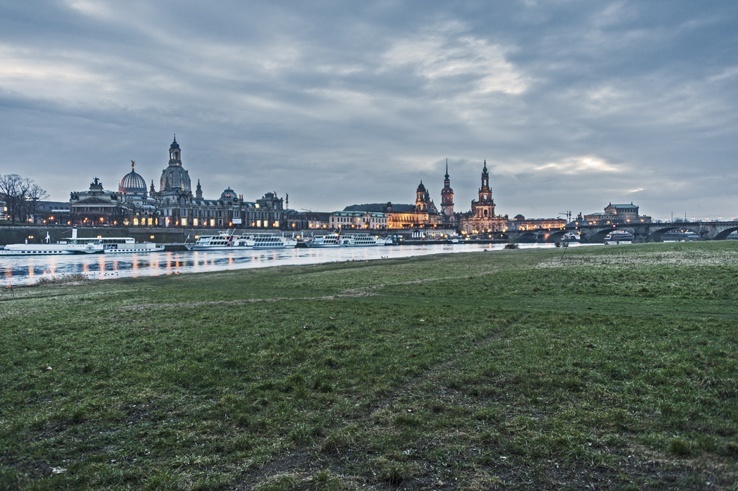 You really gave us a great taste of Dresden through these pictures. I love the idea of having the local direct your itinerary. I didn’t know much about Dresden but what a lovely city. I especially like the Grosser Garden and those funky buildings. 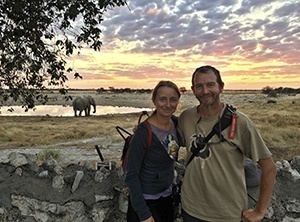 What a great idea to be led by the locals! 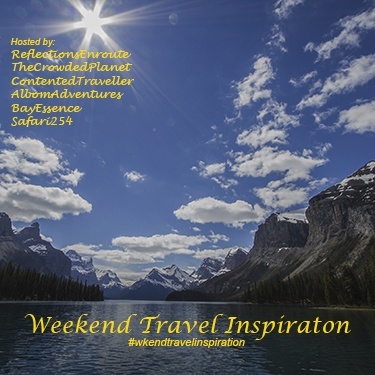 I would love to try this on my next trip. 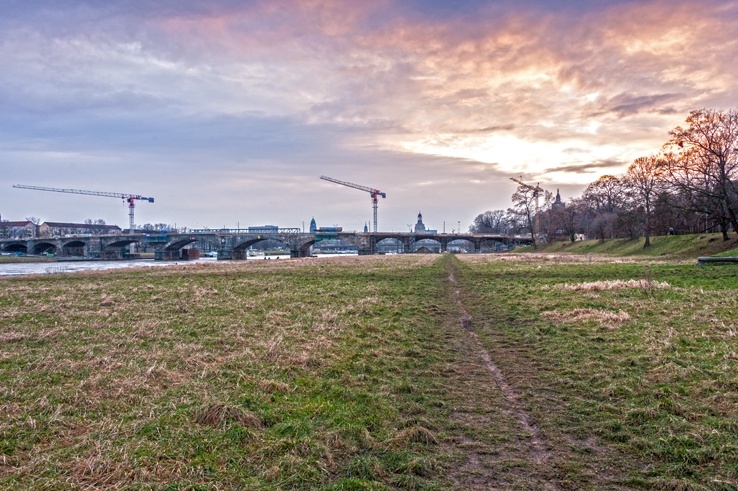 Beautiful photos, Dresden looks awesome and its history makes it so interesting.